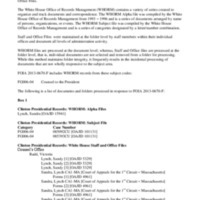 This collection consists of records concerning Sandra L. Lynch’s nomination to the United States Court of Appeals for the First Circuit in January 1995. This collection contains forms, letters, and resumes concerning Lynch’s professional career. The collection also contains materials authored and co-authored by Lynch.